Postage and packing within Germany is 3,90€. For orders of more than 34,90€ the shipping is free of charge. Postage and packing within Austria for orders of more than 70,00€ the shipping is free of charge. For orders of more than 40,00€ the shipping is 3,50€. For orders below 40,00€ the shipping is 7,50€. Shipping costs will always be visible before completing the ordering process. How many seed pads are in one seed pad bag? Each seed pad bag contains one seed pad and one cover. To fill Heimgart up completely, you need two seed pad bags. How many seed pads are in a Heimgart seed pad set? 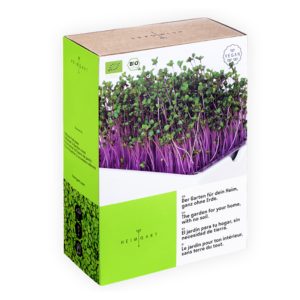 A microgreens seed pad set comprises six Heimgart seed pads. The sets are either single-variety, for example 6 x garden cress, or available as a mixed set. The mixed set consists of one of each of the six varieties. then ask us at post@heimgart.com or on Facebook.